June 1. heard of the fate of Reg't. 24 men lost. 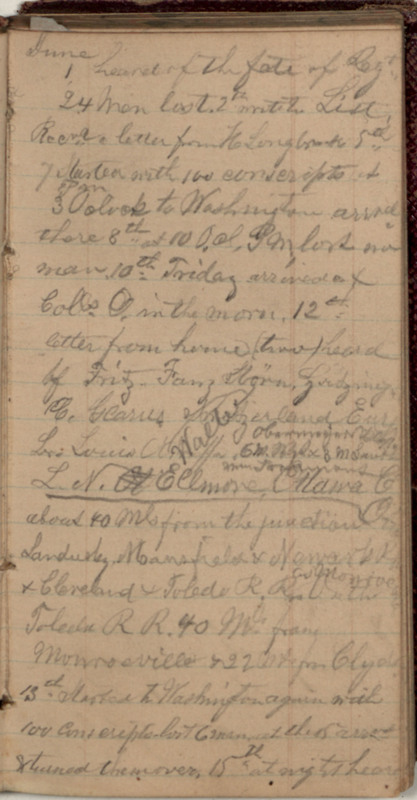 2th write to Lieut, Recv'd a letter from H Longbrake 5th 7 Stared with 100 conscripts at 3 pm Oclock to Washington arrvd there 8th at 10 O,cl, PM, lost no man. 10th Friday arrived at Colls. O. in the morn. 12th letter from home (two) heard of Fritz. Fany Horn, [Gridging? ], C.[Gearus? ], Switzerland, Europe: Louis [?]. [Obarmajon?